First Line offer custom made adapters. Please contact First Line to discuss your non-standard adapter kit requirements. 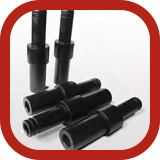 The following Adapter Kits list is for Standard permeate port lengths. First Line will customize non-standard permeate ports depending on customer requirements. Please contact First Line for the correct adapter type. NOTE: Please check the pressure vessel rating of your pressure vessels before selecting the adapter kit. The First Line Adapter Kits are subject to change without prior notice. Please contact First Line for the most updated specifications.